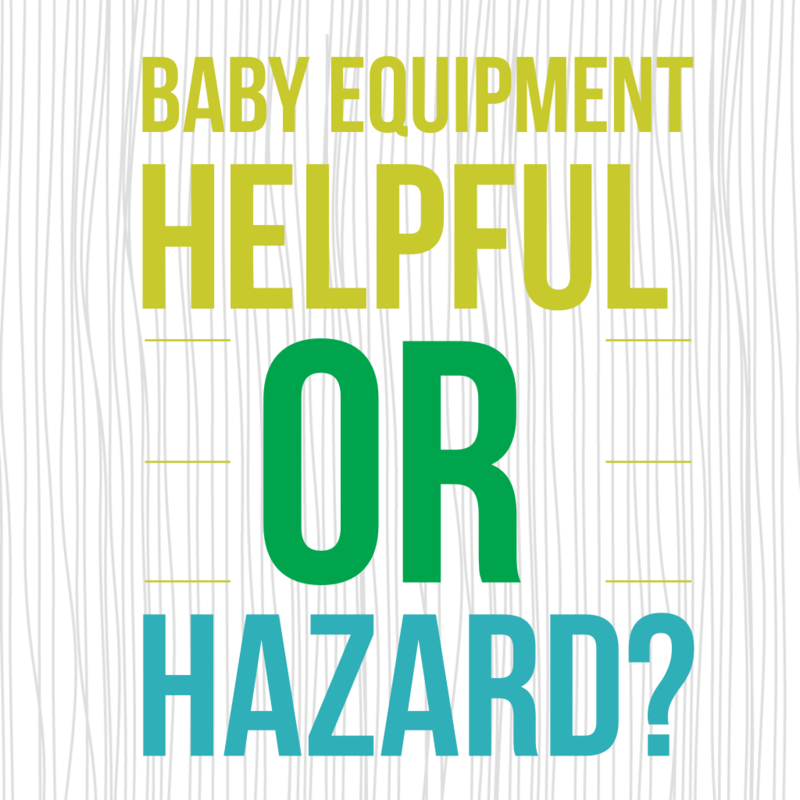 Baby Equipment: Helpful or Hazard? The early stages of child development can be related to the stock market. It changes every day yet it’s fairly predictable, and the better you understand the why’s and how’s of it, the more likely you will make choices that support its successful growth.If there’s one thing that is certain about parenthood and child-rearing, it’s that we all want what’s best for our children. We may go about it different ways and to the best of our abilities, but our end goal is to raise capable, independent, creative, socially-adjusted, loving, and empathetic humans. At least that should be the goal of parenthood. As a new parent, traversing the early years of your child’s life can seem like an endless question and answer session. We are full of questions and rely on others we view as more experienced for the answers: pediatricians, family members, neighbors, teachers, parenting book authors, bloggers, and GOOGLE. Mostly, Google. Some parts of parenting don’t come naturally – like how we should discipline or feed our children. These choices are marred by our past childhood experiences, TV shows and movies, or a narrow understanding of the complex brain and body of a newly-made human.Another area of parenting that we may be unfamiliar with is what we purchase for our children. Visit any baby store or online baby retailer and you will be inundated with category after category of “must-have” baby items. As a new parent, you may assume you need one of each! Why else would they make a diaper wipe warmer or $350 baby monitors if we didn’t need them? Let’s ask ourselves, why do manufacturers produce products? To make money. Sometimes to solve problems… but mostly to make money. Look at your own credit card bill for proof. And what problem are many baby equipment manufacturers trying to solve? Babysitting. Parents naturally want babies to entertain themselves for part of the day, so they can get stuff done. I get it… right now I have piles of laundry that need to be folded, a full dishwasher, and a stack of mail yet to be opened. But I use nap times to get that stuff done and am fully present during wake times, keeping close observation on my baby and interacting with presence. I make this analogy to begin my discussion about infant equipment and toys because we can all relate. We’ve all been sold “must-have” products that proved to be “must-give-away” burdens after just a couple months. As a pediatric occupational therapist, I have strongly formed opinions on the types of equipment and toys we expose our developing babies to… they aren’t all harmless and in good fun. These opinions are guided both by my education as well as professional experience and research. Below I take a look at the most common baby equipment items that parents may want to reconsider using with their children. Don’t feel bad or scared or nervous if you have been using this equipment. Just make an informed decision about whether or not you are going to continue using it – that’s my only goal of writing this article! Baby equipment steals valuable time from your baby that could be spent exploring their exciting new environment in developmentally-appropriate ways. Baby equipment may place your baby’s joints in undesirable and unsafe positions that can hinder healthy physical, sensory and proprioceptive development. Baby equipment should not be used as a babysitter. Instead, place your baby in a safe gated and/or baby-proofed area on their back with developmentally-appropriate toys nearby. This teaches self-directed, independent, and creative play and allows for freedom of movement. Baby equipment is a waste of money as your baby will quickly grow out of or tire of a swing, bouncer, seat, or walker. What costs much less and is more appropriate? A blanket, a silk cloth to play with, a ball, blocks and a stuffed animal. Baby equipment is dangerous and can lead to injurious falls resulting in head injuries and broken bones, especially if manufacturer’s instructions are ignored or use is unsupervised. Baby equipment places babies in positions they are not developmentally ready for which may result in insecurity, fear and “skipping” developmental milestones such as crawling. If you’ve been using baby equipment, don’t fret. You can make an informed decision on whether or not you want to continue using it. I suggest coming up with safer alternatives for the equipment’s purpose such as baby-proofing an area of the home for free play. Floor time allows for developmentally-appropriate play that naturally progresses gross and fine motor skills following the baby’s internal lead and motivation. 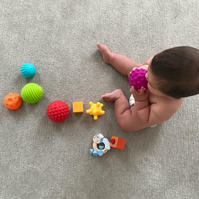 Sensory balls, wooden blocks, and wooden teethers can be manipulated, thrown, passed from hand to hand and help develop healthy coordination, strength, and control. Bumbo seats are one of the most common pieces of baby equipment I see parents purchase. Bumbo seats are foam booster-type seats you place on the floor to keep your baby in an upright position before they can get into that position themselves. Bumbo seats now come with harnesses that strap the child into the seat to prevent past safety hazards such as a baby falling out of the seat. Parents have told me they use Bumbo seats so their baby can look around or so they have a “safe place” to put the baby while the parents do chores around the home. I actually have a solution to that problem that is free.So what’s wrong with this harmless-looking baby seat? First and foremost, it restricts movement like most baby equipment. Babies of all ages have a deep internal desire to explore their environments in a way that only freedom of movement can provide. When a child is strapped into a piece of baby equipment for hours and hours a week, that is quality time that should have been spent on the floor wiggling around in whatever way the baby pleases. When an infant is placed on the floor in a safe space, they have the ability to engage developmentally appropriate muscles that will eventually result in better control of their bodies….and this leads to the self-esteem required to participate in creative and independent play.Not only that, but the Bumbo Seat stabilizes the postural muscles and hip joints in a dependent position with the hips placed lower than the knees and the feet floating above the floor. This awkward position both shortens muscles and ligaments and deactivates joint proprioceptors, disallowing for natural weight-bearing positions like tummy time or laying on the back or side. On top of that, it places the baby’s pelvis in a posterior tilt (bum slightly tucked under their hips) which is the least ideal pelvic tilt for any human, at any stage of development. This results in shortening of hip flexors, oppositional muscle imbalances, and disengagement of the abdominal muscles. Where can you place your baby so they can look around, play with toys, and experience this new enthralling world? On their back. Simple. Set aside a safe play area in your home where you can lay your baby on his or her back while you do chores nearby. If your baby is able to roll over and crawl, it’s best to use a gated play area to keep them in a contained, baby-proofed space. Floor time has been shown in research to support the successful development and progression of gross and fine motor mastery, so before you add a Bumbo seat to your registry or use that hand-me-down from your neighbor, don’t discount the natural progression of development which starts ON THE FLOOR. Walkers have made the news for the last couple decades after thousands of children a year were being injured in falls and accidents. They were flat out outlawed in Canada in the early 2000s, and American manufacturers altered their design so that babies couldn’t move quite so fast and far on wheels, limiting chances of falling down stairs or using the walker to gain access to dangerous items in the home like cleaners and stovetops. I won’t go into the scary details of some of these accidents, but they are enough to make a parent’s stomach turn and hyperventilate. Walkers, even those harmless looking activity center walkers (see photo), need to be reserved for a baby who can independently walk and must be supervised in a baby-proofed environment at all times. My biggest peeve with walkers is that we’re essentially asking our children to participate in a major gross motor skill they are neither physically or mentally ready for. If a baby cannot walk unassisted, they should not be pushing a walker around the home. If you couldn’t physically run at a 15 mph pace, would you want to be placed on a treadmill set at 15 mph? Why do we try to rush our children’s development with baby equipment like walkers then? Humans have their entire lives to walk and run, so why do we so want our 10-month-old to be walking already? I truly believe that as parents we tend to subconsciously project our expectations on our children. We feel a sense of pride every time our child hits a milestone, so we competitively hyper-focus on milestones and how we can achieve them as quickly as possible. Babies learn to walk anywhere between 9 months and 15 months of age. And anywhere in between is completely typical. If you truly are concerned about your child’s lack of mobility, please get a free evaluation through your state’s early intervention program with a licensed occupational or physical therapist. They will be able to tell you if your baby truly has developmental delays preventing them from reaching particular gross or fine motor milestones.Ideally, your baby will teach themselves to sit, scoot, rock, crawl, pull to stand, cruise along furniture and then once confident with their stability and strength… take their first steps. There is absolutely NO NEED for baby equipment – humans have been learning these skills for thousands of years without the “help” of plastic wheeled toys. A lot of the same reasoning behind limiting the use of Bumbos and walkers for infants is the same for bouncers. Strapping a child into a position they cannot get into themselves limits their ability to explore their environment, weightbear (which sends messages to their central nervous system via their joints and is extremely important for motor control and sensory development), and have adequate time in preparatory positions (i.e. back, tummy and side) that develop the skills for more advanced gross motor skills like crawling and sitting. Again, placing your baby on his or her back in a safe space with you nearby and a few developmentally appropriate toys within reach is all your baby needs. Not only will this reduce unsightly equipment in your home, but you will save money on a useless and potentially harmful plastic product. If you use bouncers for naps, instead I suggest using a vibrating rocker like the Graco Lounger which is also an excellent choice if your baby has reflux. It places baby in a slightly inclined, safe position on their back suitable for short naps. It’s low calming vibration is less likely to overstimulate their sensory system unlike a bouncer. Babywearing is a term that has created a whole new industry and coalition of like-minded mamas. It allows mamas to comfort their baby while still being able to use their hands for personal tasks, or for caregiving tasks for older siblings. Slings and carriers are pretty fantastic if you’re the outdoorsy type – we take Grace for hikes in ours all the time! I also baby-wear for times of convenience such as grocery shopping, going on a beach walk, or running errands, but the amount of time I use a sling or baby carrier a week amounts to no more than 5 hours. Baby-wearing is very popular in the Paleo and natural motherhood communities, and I totally get why. Mothers have a primal desire to be close to their children, and wearing them against our bodies has been shown to help regulate their body temperature and heart rate in premature babies, improve bonding, and make breastfeeding more convenient. Who doesn’t want to have their baby snuggled up to them all day? While that may be what we want, when babies reach about 3 months of age, they really deserve to have freedom of movement. And that just can’t happen if they’re strapped to their mamas all day.I met a woman at the grocery store this week who commented on my Ergo Baby 360 Carrier (which I recommend over the Baby Bjorn carrier). She said she wore her baby for 3 years straight and “never put her down on a playmat once”. She said it with pride. I smiled but internally I cringed. While this is an extreme case, I added baby slings to this list to provide a different perspective on baby-wearing and to make a case against this extreme or even baby-wearing all day at home so you can “get stuff done”.Imagine having your baby strapped to you for most of the day while you do tasks around the house or run errands. He’s with you while you clean toilets, wash dishes, walk your dog, and make dinner. While this closeness is lovely, that is a lot of waking time that your baby is unable to move and wiggle and weightbear as he may please.And that doesn’t even consider positioning faux-pas that may occur with a mal-fitted sling. If baby’s spine and hips aren’t aligned well in a sling or baby carrier, and they maintain this position for many hours a week, musculoskeletal issues could result. Babywearing International is a non-profit organization that holds meet-ups around the country so mamas can try out different options and get fitted properly. I highly suggest finding one of these meet-ups through their website if you choose to babywear. I also want to point out the musculoskeletal and postural deficiencies that can result for the babywearing mother. Babywearing front-loads your body with additional weight it is not used to carrying (remember pregnancy?). This can bring your pelvis into a posterior tilt, shortening hip flexors, tightening hamstrings, and pulling on your hip and knee joints (which may already be more lax than usual from pregnancy and breastfeeding hormones). I also find it’s easy to disengage my abdominals when I’m baby-wearing which further exacerbates this non-ideal pelvic positioning. This is of particular importance for new mothers with weak pelvic floor function (me, me). Motherhood and caregiving tasks are already a repetitive strain on the body, and excess babywearing may increase chances of injury. Pregnancy may have already altered your gait, pelvic stability, and core strength, so our post-partum bodies need extra TLC from proficient healthcare professionals such a pelvic floor therapists, personal trainers, chiropractors and acupuncturists. Babywearing is amazing and I 100% support it. But if you find that you’re defaulting to placing your baby in a sling to calm them down or help you “get stuff done” (especially after the age of 3 months) for many hours a day or week, I suggest transitioning some of that time towards independent floor play. This will both help your body AND your baby’s body. Your baby will learn to feel secure playing independently on the floor. You can help facilitate this security by observing nearby on the floor with them while allowing them to manipulate toys on their own, or simply wiggle around on the floor to their own rhythm. We do not need to entertain children; this big, beautiful world provides adequate stimulation and experimental learning opportunities. Remember, mamas, just because one of the above pieces of equipment didn’t affect your child, it may exacerbate developmental issues in another child. We must agree that our babies are unique individuals with unique needs, and a piece of equipment that seemingly didn’t cause issue with our friend’s baby or our first-born, may be a negative environmental stimuli for another child. Like with all parenting choices, approach them using both your intuition and self-guided information gathering with careful observation of your individual child’s needs, capabilities and pursuits.